Cleanliness is important in all workplaces, so having the correct receptacle units to help keep your premises clean. This Swing Bin is simple, stylish and is suitable for any room. The swing lid prevents smells from transferring into the room so you are able to throw a variety of items in it. It’s generous in size and has a 25 or 50 litre capacities, a height of 540 or 665mm, a depth of 270 or 335mm and a width of 335 or 420mm so holding a large load of items is not an issue. The body of this bin has a glossy plastic finish so you can guarantee that it is waterproof, easy to wipe clean from any spills and is easy to maintain. There are three colours available; silver, calico or mocha; we are confident you will find one to suit your business. 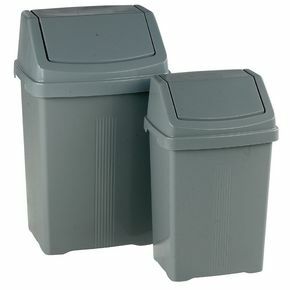 Our swing bins are a great addition to the workplace, providing an excellent waste unit to help keep your rooms tidy and they are available for Next Day UK Delivery.